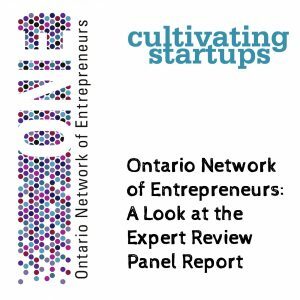 An expert review panel recently completed a report on the Ontario Network of Entrepreneurs (ONE)—the main program of the Ontario government for providing funding to organizations supporting tech or innovation companies and startup ecosystem. The ONE’s Regional Innovation Centres are located in 18 cities across Ontario. And the review panel has recommended big changes: they want the government to become “a strong central authority” in the management of the program and recommend a diminished role for MaRS and for many of the regional organizations at the core of the ONE—many of which would no longer be called regional innovation centres. Communitech and Invest Ottawa would be promoted to Provincial Innovation Centres, and the panel recommends a “significant increase” in the province’s funding of innovation programs. On this episode, we dedicate the entire show to a look at the expert review panel report with a focus on some of the more contentious recommendations. The panel humbly suggests that its recommendations will be criticized because they are “disruptive to those vested in the status quo.” Well, we have problems with the status quo … and with some of the review panel’s suggestions. On the podcast we discuss why some of the recommendations would be a step backwards for Ontario. Why isn’t their a standard metric to benchmark results. This has been an ongoing criticism for a long time — and something I talked about a lot on episode 2 of the podcast. It’s not as easy as it sounds, but at the same time we’ve never done a good job of it. Government programs tend to have you count lots of things, but usually just simple things that are easy to count. The federal government made a start on getting people to develop a common “performance measurement framework” (link in episode 2 shownotes), but there’s been no update in the last year.